This article appeared in the 1973 edition of 'Your Village'. The comments in round brackets date from 1973, not the 21st Century! 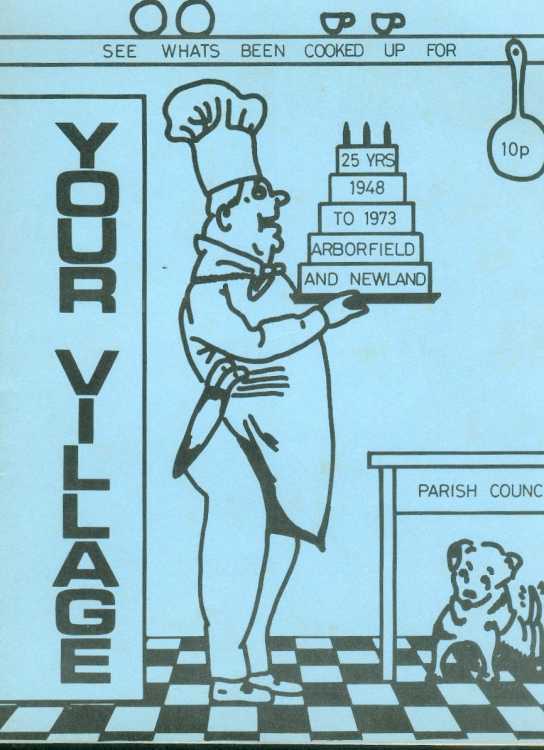 A number of Arborfield residents have enjoyed hearing a first-hand account – given with characteristic humour and enthusiasm – of life in Arborfield sixty years ago by Miss Edwards, a former resident of the village, an ex-secretary of the P.C.C. and now a retired headmistress. Arborfield was then a very small and compact village centred round the cross with only a few houses in Lower Arborfield, none in Church Lane, and only Cross Lanes Farm on the main road between Greensward Lane and the Cross. 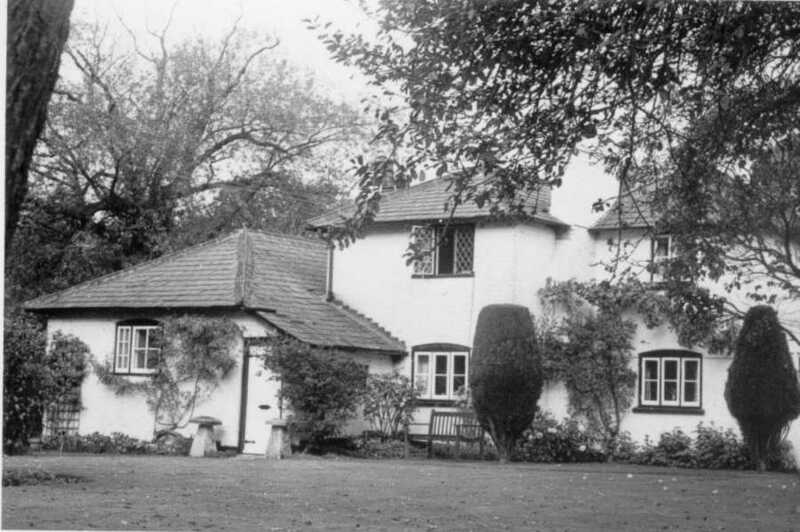 Miss Edwards lived in one of the two cottages opposite the Grange gates, then known as the Grange Cottages and now as Bridge Farm Cottages, as her father was successively coachman, groom and chauffeur to the Rickman family who then occupied the Grange. This part of the village was always badly drained and Church Lane was frequently flooded in winter, as was the main road to Shinfield. On one great occasion, there was even skating on the meadows beyond the bridge. The main road, like Walden Avenue used to be, had large pot holes making huge puddles in winter and in summer causing clouds of dust. Apart from a few steam engines, traffic was largely horse-drawn carts, wagons, wagonettes, broughams, etc., and it was the practice to scatter a load of straw on the road outside the house of anyone who was ill, to quieten the traffic noise! However, by present-day standards, life was relatively peaceful! There was, of course, no bus service to Reading and one either had to walk or go by carrier’s cart, room permitting. 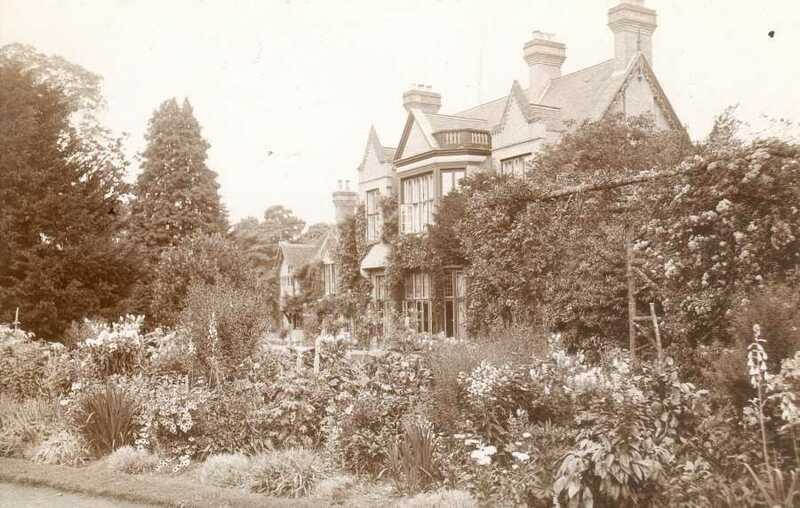 Alternatively the carriers – Fullbrook of Arborfield (who lived at the Pheasantries), Maybanks of Finchampstead or Baylis of Barkham – would do one’s shopping instead. Day-to-day needs were catered for by Mr. Seymour the grocer, on the site of the present stores, by Miles the butcher from Shinfield, and by a baker’s cart. Mr. Mattingley presided at the Post Office and the Garratt brothers ran a thriving building and decorating business behind the present bus shelter [removed in 2004 when the roundabout was completed]. The village also supported a blacksmith – next to the Post Office – a wheelwright bearing the well-known name of Bentley (Mr. Guy Bentley’s father) and even a tailor by the name of Tayler. In sickness the villagers were attended by Dr. Walker from Swallowfield Grange travelling on horseback or by pony and trap. 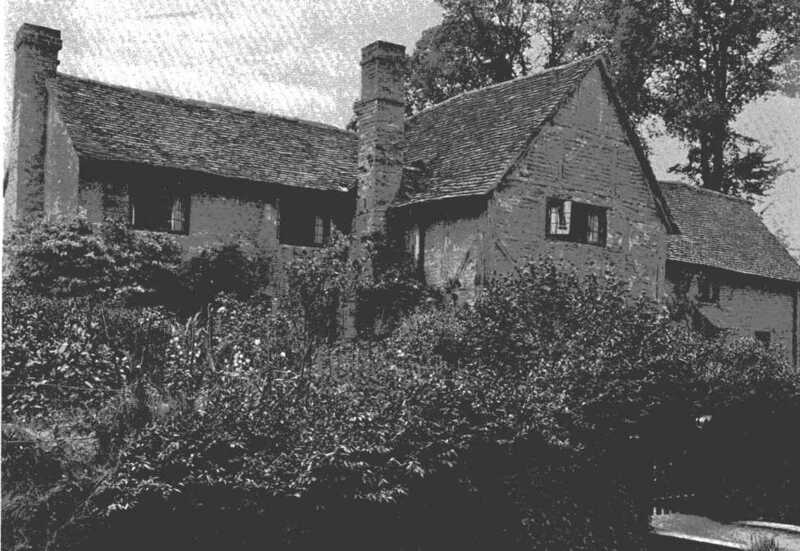 The “Bull” was kept by the two Miss Radburns, who later retired to the thatched almshouses in Greensward Lane which have recently been pulled down. The Garrison was then known as the Remount Depot where mules from Ireland and horses were broken in and trained, and from which they would occasionally stray! 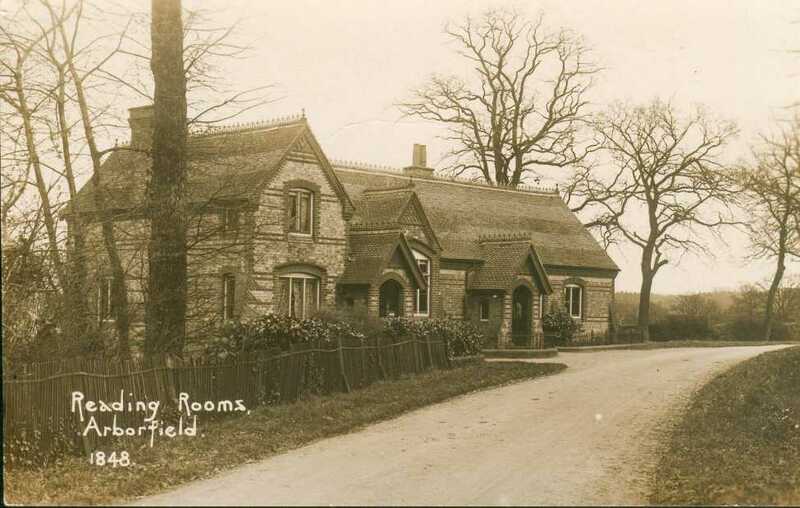 This was before the days of the village hall, and meetings were held in the Reading Room in Church Lane. These included Sunday School, Mother’s Union and “Mothers’ Meetings” (a forerunner of the present Wives’ Group?) at which rolls of material provided by the ladies of the village were sold cheaply and made into garments whilst one of the ladies read aloud. Life in the village centred very much round the Grange and the Hall. 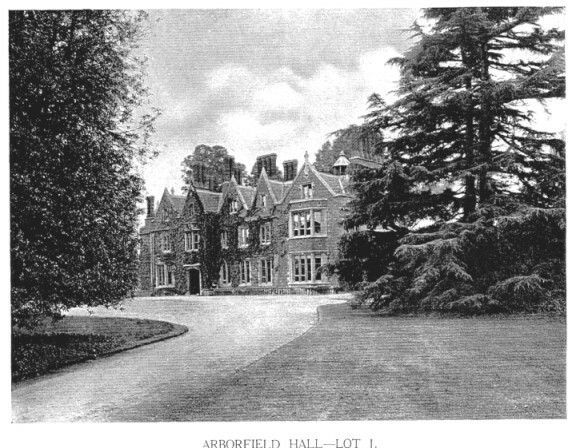 Arborfield Hall stood in a prominent position in the park close to the river on the site where a new house has recently been erected for the Director of the N.I.R.D. The Hall has only been demolished in the last twenty years. At this time it was the home of a Mrs. Hargreaves, said to be a descendant of the James Hargreaves who invented the “Spinning Jenny” in 1764. This lady is said to have been a somewhat formidable character who travelled about by pony-chaise and occupied a privileged seat in the chancel of the church. 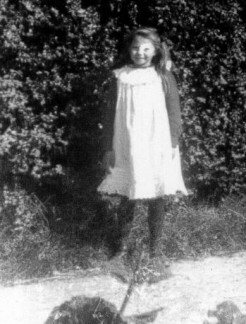 She provided a summer fete for the children of Arborfield and Newland who would assemble at the Lodge gates and march down the park behind a band. 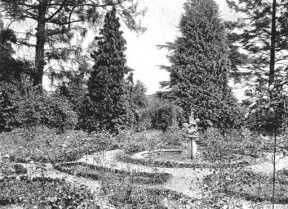 They would be met by Mrs. Hargreaves seated at the entrance of the Hall in her bonnet and attended by her maid, and they would sing “The Minstrel Boy”, “The Ash Grove” and “Land of Hope and Glory”. After this performance they would line up, curtsey, and be rewarded for their efforts with a handful of gingerbread biscuits. 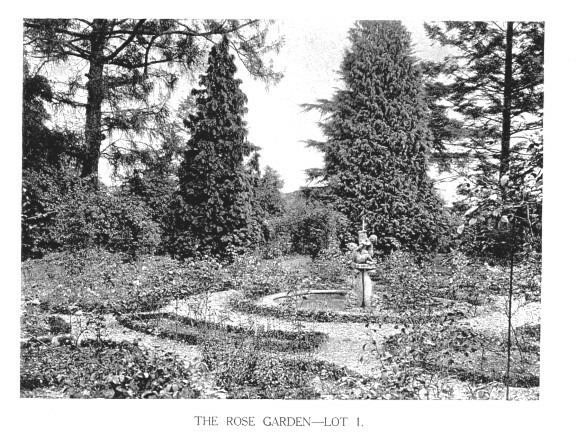 After this, they were free to roam around the grounds, to enjoy the swing-boats specially imported from Reading, or to take part in races, before it was time for tea, which was laid out on long tables. This would be followed by more games and races, after which prizes and gifts would be presented on the terrace. About seven o’clock, parents were allowed in to wander around the grounds. 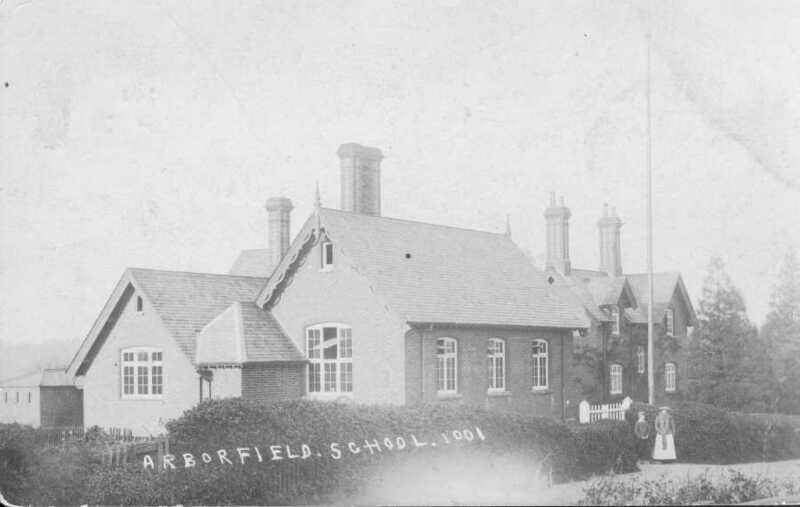 At that time, Arborfield boasted a cricket team which played its matches in the park. At the Grange, Captain and Mrs. Stuart Rickman took a great interest in the children and in all the people of the village where they were greatly respected. Their nephew, Philip Rickman, is now a famous bird artist. They provided a Christmas treat for the children every year when a sumptuous tea was prepared in the Grange kitchens. This was followed by an entertainment consisting of either a Punch and Judy Show or a conjuror and ventriloquist from Reading. The girls were given new scarlet cloaks made in the Grange and the boys grey jerseys. The Rickmans were great supporters of the church and each Christmas gave everyone in the village a present which ranged from a brace of pheasants to an iced cake or a tin according to their “station”. The Grange was also the scene of “marvellous” private parties, with marquees on the lawn, cans of cream and once a bagpipe band brought specially from Scotland. 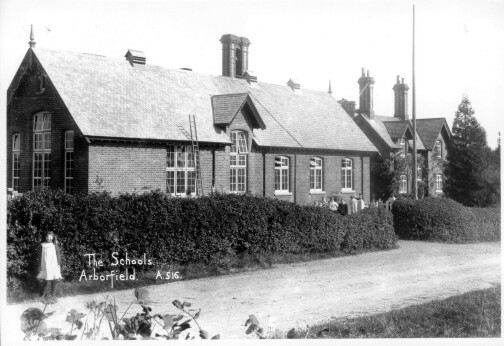 The school at that time had newly moved from the small premises in Greensward Lane – now two houses – to the present site in School Road. The school building comprised four rooms, one divided by a curtain, and heated with open fireplaces. One room was set aside as a play room which the children could use before school or when it was wet at playtime. They also had swings in the playground. “Jimmy” Hayward, the headmaster, allowed the children to bring potatoes to bake in the ashes of the open fireplaces and in the winter allowed them to slide on the frozen pond. Perhaps the winters were colder then, as it happened quite often. It presented a colourful picture, with the girls in their scarlet cloaks, and it says something for their standards of behaviour in that supervision was considered unnecessary. 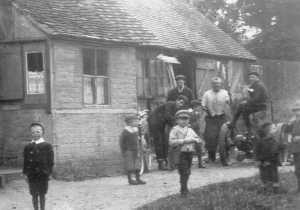 In their dinner hour, the children would catch minnows and tadpoles in the pond at the bottom of the road, scramble across the fields to fill their satchels with chestnuts in “Chestnut Park”, or watch horses being shod at the smithy. On the other hand, the girls in their black stockings and button-up boots were expected to curtsey to everyone “from the rector upwards”! The church featured largely in their lives at that time, and a thriving and competent choir even attracted people from Reading. 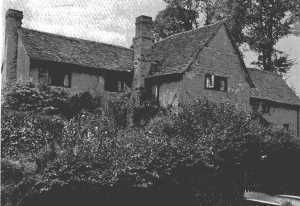 A retinue of servants from the “big houses”, with the maids in black bonnets and long black skirts would sit in special pews and after the service the children would often go for a walk through “Parfitt’s Farm” (now Bridge Farm) and round Pound Copse. The annual choir outing was a major event. During the First World War they were limited to places like Streatley, but afterwards it was a day at the sea at Southsea or Ramsgate. This called for a 5.a.m. 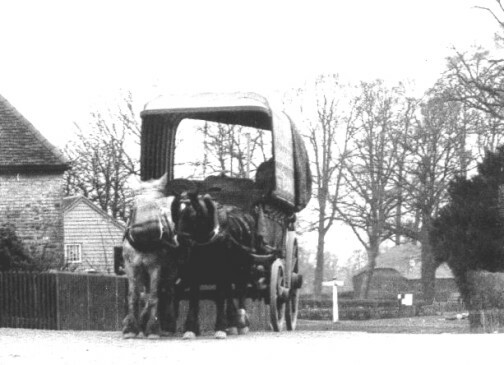 start from the Cross in Mr. Bowyer’s farm wagon from Newlands Farm, which took them to Wokingham Station and brought them home again at about midnight. Choir Practice was first held in the home of “Teacher Frances” (now Mrs. Edwards who, at 92, is one of the oldest inhabitants, and still [in 1973] active in the village) and later in the school. 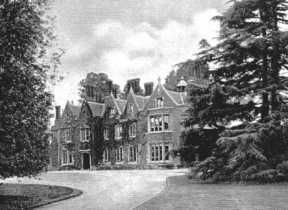 Other meetings – the Monday “Band of Hope”, and the “Sewers’ Band” were held at the Rectory. The children would be escorted there by “Aunty Kate” – Mrs. Kate Emblen, the mother of our well-known Harry Emblen who now lives in South Africa but still closely follows the affairs of the village. She was a great church worker and would regularly walk with the children from Swallowfield Road to the Rectory and back carrying a lantern with a candle in it to light the way. At the “Sewers’ Band” the girls would make various items for a sale of work at Reading Town Hall. During the war they would also join a Saturday working party at the Grange making roll bandages from yards of unbleached calico whilst the ladies made hospital shirts. They would also display their handiwork at the Arborfield and Newland Flower Show, held in a marquee at Newlands. A standard work in their repertoire was a Nainsook pinafore with wide lace across the chest and over the shoulders. Another feature of the flower show was a prize for the best kept garden. Other local excitements included the Annual Blackwater Fair, when herds of cattle were driven through the village from Reading Station. Tramps seeking hot water for tea, and pedlars, were quite common. The latter included a weekly Friday visit of a barrel organ and monkey from Silver Street in Reading. These were carried on a donkey cart and the children would love to turn the handle of the organ. Another regular was the collector of ‘jam jars and bottles’, for which windmills were given. 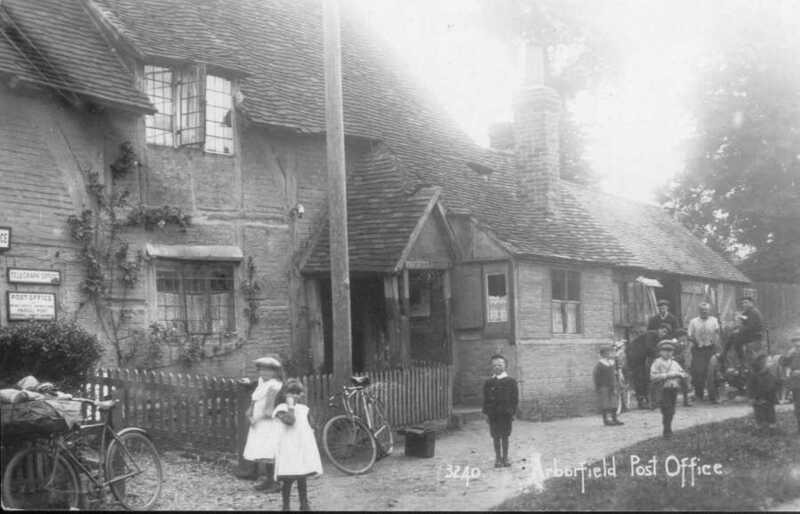 Another local character was “Blind John of Arborfield” who lived in the centre one of three very poor cottages by the bridge – later converted and modernised to become ‘Bridge House’. John could find his way to Arborfield with no difficulty (traffic was rather less of a problem then) where the charitable residents gave him money which he kept in a calico bag. He was a great whistler, and when he was not whistling, he was said to be swearing! When he died the villagers subscribed for a stone in the churchyard on which his whistling is recorded. 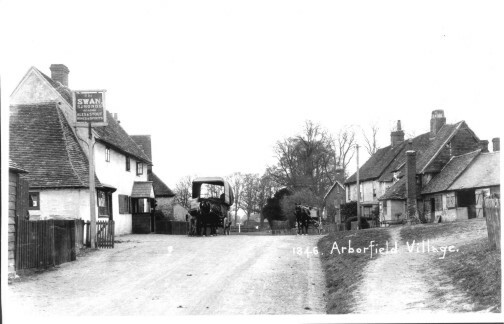 Yes, life in Arborfield has certainly changed since those days; but I wonder if ALL the changes have been for the better?